When you think about top quality cigar makers in the world, many have been established for several generations. 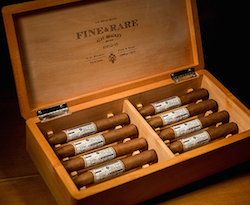 It might surprise you then that one of the top cigar makers has only been in existence sine 1996. In that short amount of time, the Alec Bradley Cigar Company has become one of the best known brands, repeatedly grabbing a spot in the coveted top 25 cigar lists. Founded by Alan Rubin, his vision was to develop a cigar brand that gave cigar smokers a one-of-a-kind experience they would not soon forget. Fast forward to today, and Alec Bradley Cigars are world-renowned as a first class purveyor and producer of premium cigars. As the Alec Bradley brand continues to receive top ratings from their loyal clientele and critics around the globe, it is important to look back at how this particular brand leaped to super stardom in such a short amount of time. Back in 1996, Alan Rubin had just sold the family import business and was looking to set off in a new direction in his life. His passion at the time was cigars, and he was committed to bringing the hand crafted tradition to a worldwide audience without neglecting the precise attention to detail that makes a premium cigar. He got his foot in the door of the cigar industry by developing Occidental Reserve with Ralph Montero and Henke Kelner. 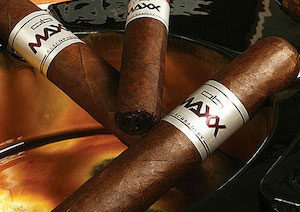 As their line of cigars expanded, they introduced the Trilogy, a triangle pressed cigar, and Maxx, an affordable 60 ring gauge cigar. In only ten years, the Alec Bradley name has already acquired a substantial reputation in the cigar world. During that short time, this cigar manufacturer has continued to push the envelope, bringing new innovations to this industry that excited the buying public and critics at the same time. While the industry was on edge waiting for the next new release, the Alec Bradley Cigar company gave the world something they were not expecting. The release of the Tempus really raised the bar for this company and placed them on the map as one of the top companies in this highly competitive market. The Tempus cigar was derived from Latin meaning “TIME” and was a representation of the commitment and time involved that Mr. Rubin invested into the age-old traditions utilized to produce the perfect premium cigar. To create a one-of-a-kind smoking experience with Tempus, Mr. Rubin partnered with a very small family run operation that would grow the perfect crop, then ferment, and eventually roll the tobacco. He was instrumental at the time in overseeing the entire operation from the growth to rolling of the tobacco. The cigar continues to be one of the best selling for the Alec Bradley Cigars company, and is seen on many best cigar lists around the world. 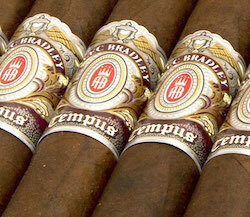 Fueled by the success of the Tempus, the company has gone on to produce many more high-quality premium cigars like the Maxx, Connecticut, Prensado, Mundial No. 5, and the Family Blend. Over the past decade cigars from the Alec Bradley company have been continually recognized in the Cigar Aficionado Top 25 Cigars of the year. In 2014, the Alec Bradley Cigar company was once again recognized for their exceptional high quality cigars when the Alec Bradley Mundial No. 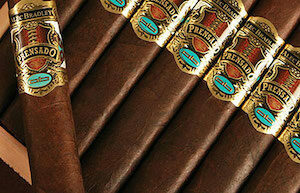 5 Honduras made number 16 (with a 92 rating) on the list of Top 25 Cigars. The Mundial was in development by Mr. Rubin for over five years, and is a unique blending that includes a wrapper from the Trojes area of Honduras. An especially unique quality of the Mundial cigar line is the pointed foot that seems to resemble lances. The labels read “Punta Lanza”, which translates to the point of the lance, the unique shape of this extremely popular cigar. What makes this No. 5 blend so enjoyable for smoking aficionado is the mineral, leathery, and meaty taste. We also carry Alec Bradley accessories including the Burner Table Cigar Lighter, Bump Ashtray, Hendrix Lighter, Shotgun Ashtray, and the Pocket Flask. 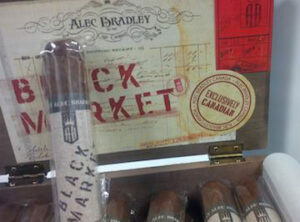 BRAND NEW – CANADIAN EXCLUSIVE- Alec Bradley Black Market CHUNK ! This 4¼ x 60 Honduran chubby little bugger is more than ideal for the winters we deal with here in the Great White North. So if there was ever an argument that Alec Bradley didn’t love Canada, that debate ends right now. And if you want one, you have to come to Nottingham Cigars & Pipes. Thank you to Alec Bradley Cigars & its Canadian subsidiary.